Send random command through carbide motion to move to point? Maybe there is a way to do this already. I’m putting a square corner where zero is that I’ll align every piece and probe but right now I have to boot up the machine, home it (top right) then job it all the way to that corner and try to line it up with that probe. Ideally, since the square and probe will always be in the same position I save this position and have a button or command automatically move there to speed up setup. Is there a way to do this with motion, basically tell it to goto x,y,z? Is there a way I can “send” this command in from an external app so I can make a physical button do this? X0Y0Z_: Coordinates of where to move, fill in the blank for Z with something safe. Personally, I’d likely just do “G0X0Y0”, leaving the Z axis untouched. If you do use a non-zero Z, it obviously would depend on what units you’re using (millimeters, G21, or inches, G20), and I’ve not checked to see whether that’s sticky/stored or needing to be sent each time. (You’ll see it at the top of g-code files for the obvious reason.) If you’re just going to X0Y0, zero is zero regardless of units. You should be able to simply click to the the MDI tab and enter that one line. If manually entering one line is easy enough, that should do it. As far as sending it to Carbide Motion from an external app (or a nice big zero button configured as a USB HID and backed by an AutoHotKey script), I’m not confident that is possible without excessive bodging. To do something similar with most well-behaved Windows apps, I’d send hotkeys to interact with the UI to get to the right spot and input widget, then send the keystrokes to type in my input, but I don’t think Carbide Motion’s UI is designed and implemented to the level that would require. (I say that because I’ve found myself forced to use the mouse. The mouse!) While it’s always possible to bodge something together in spite of an incomplete UI (e.g. via mouse moves and clicks), it inevitably makes things brittle and will glitch at the most annoying moments. One six or eight character line of g-code manually entered is what I’d suggest as the best option with Carbide Motion. Awesome, I guess pasting in one line isn’t bad or I can use something like textexpander. I do want a button though, one step at a time. I’m going to end up SSHing to my Shapeoko and just doing everything in vi… emacs… pico… mc? I’m unclear what that does, it sounds like it should do what I want but I have yet to try it. Will try tonight. Yes that is what Current Offset does in my experience. Very handy! This moves the router to the exact spot I created my jig, plus moves the router to the top of the Z so it doesn’t hit anything on the way. 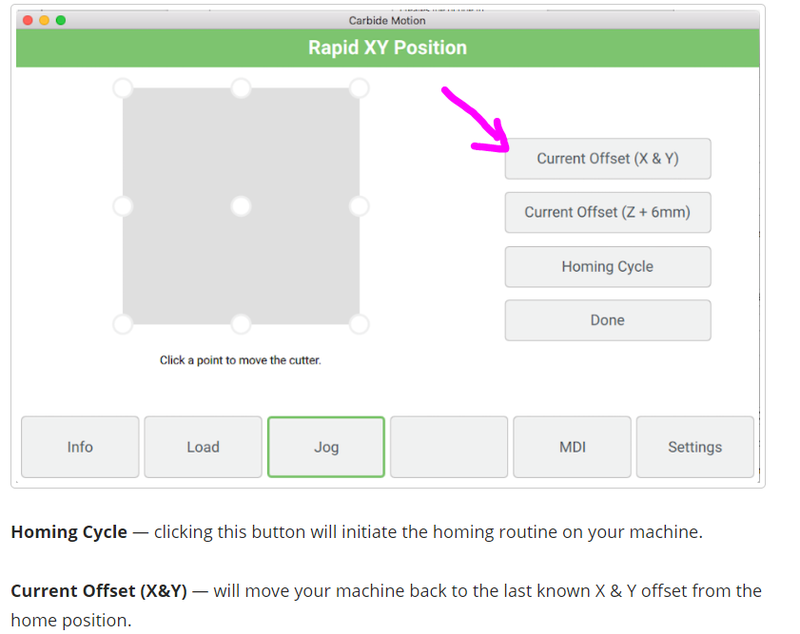 once you set your 0,0 in x & y cM will remember it relative to the home position. 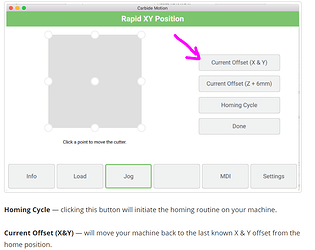 Start CM, home the machine, open JOG, Open rapid Position, click on go to current offset. I dont rapid when just starting. ialways have something in the way. okay, that works, just horrible documentation. :-/ . Thanks, this will work for now as long as I’m using the corner jig. okay, that works, just horrible documentation. Most of what grbl handles is explained here. Exceptions, additions, and clarifications can be found here. Yeah, the gcode I get, I’m saying CM doesn’t have great docs on what that button does. Even reading it now it’s unclear what current offset means, even the docs say “last know X & Y offset from home position” where offset means last known zero position. Maybe I’m just not up with the terminology yet. When you set zero, grbl stores that location as a distance from home (limit switches). That is the offset. You can see the offsets that are stored is you send $# to the controller.